Buenos Aires (AFP) - Five-time world player of the year Lionel Messi is widely expected to end an eight-month exile and be called back into the Argentina squad ahead of the country's last get-together before the Copa America. But the 31-year-old Barcelona star is suffering from a hamstring strain and even if he agrees to return, he may not be fit to play in friendlies later this month against Venezuela and Morocco. Interim coach Lionel Scaloni is due to name his squad for the friendlies on Thursday. Messi hasn't pulled on the light blue and white national team jersey since Argentina were dumped out of the World Cup in June by eventual winners France. He's also refused to comment on his international future in the last eight months. "I hope, want and believe Leo will come back to the national team," said Scaloni last year. Messi has missed six friendlies since the World Cup in Russia but most experts believe he will be a part of the squad that travels to Brazil for the Copa America later this year. Whilst he's built up an almost unprecedented collection of trophies at his club, Messi is running out of time to taste major international success with Argentina. 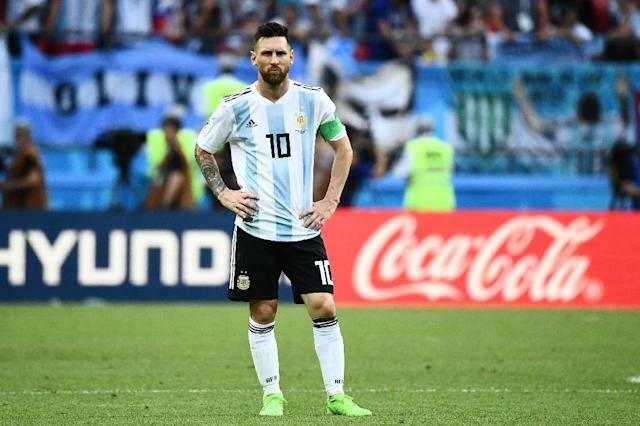 He was on the losing side in major finals three years running from 2014-16 -- first to Germany in the World Cup in Brazil, then twice to Chile on penalties in the Copa America, including the one-off Centenary edition of the competition. Despite nine Spanish La Liga titles and four Champions League crowns with Barcelona, Messi's only success with Argentina was as part of the under-23 squad that won Olympic gold in Beijing in 2008. He and a generation that can boast Manchester City's Sergio Aguero, Angel Di Maria of Paris Saint-Germain and Chelsea forward Gonzalo Higuain have consistently flattered to deceive on the highest stage for Argentina. Still, without Messi, their chances in Brazil would be severely damaged. "I know he can't wait to come back, I know what he feels for this jersey," said Argentina's football federation (AFA) president Claudio Tapia three weeks ago. However, AFA's new director of national teams, Cesar Menotti says Argentina must focus on the bigger picture rather than relying on Messi. "It's much more important to build teams and strengthen players to become champions rather than dreaming about Messi's return," said Menotti, who guided Argentina to World Cup glory as a coach in 1978. "I don't think it's right and he doesn't deserve the responsibility of winning the World Cup depending on him." With 65 goals in 128 appearances, Messi is Argentina's all-time top goalscorer. He's also Barca's top marksman ever with more than twice the number of goals as the next best. But he's never managed to match his club form when operating on the international stage. Since Scaloni replaced Jorge Sampaoli, he has presided over four victories -- albeit two of those against minnows Guatemala and Iraq -- a draw and a 1-0 defeat to Brazil. He has used the opportunity to blood some young players while the leading lights sat out. But while Aguero, Higuain and Manchester United goalkeeper Sergio Romero are expected to be overlooked once again, Di Maria should return to the squad with the Copa America kick-off just over three months away. But that may just be to offset the potential absence of Mauro Icardi, who has missed the last five matches for club Inter Milan, with whom he is embroiled in a contract dispute. Argentina play Venezuela in Madrid on March 22 and then travel to Tangier four days later to tackle the hosts.